Pen and Paper: THE DAY THAT A RAN AWAY. THE DAY THAT A RAN AWAY. 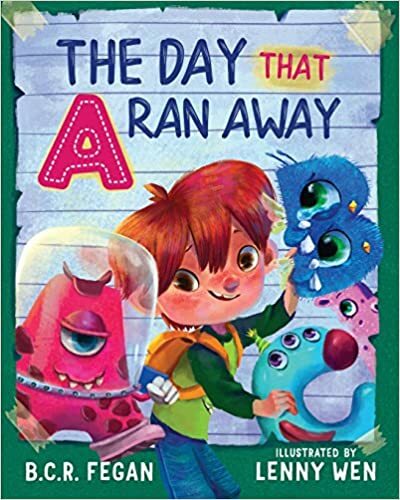 THE DAY THAT A RAN AWAY by B.C.R. FEGAN (With illustrations by LENNY WEN). I think he went riding. SOURCE ... Received with thanks from the Publishing Department at TaleBlade. The Day That A Ran Away is to be released tomorrow (1st September). MY THOUGHTS ... After numbers in Don’t Ever Look Behind Door 32, the talented duo that is B.C.R. Fegan and Lenny Wen turn their hands to what else but the alphabet in a book that, clever and imaginative; written in rhyme with glorious illustrations and, of course, that little twist at the end which is sure to raise a smile, is one of the best of its kind. The rhymes (admittedly the occasional one a little odd to my adult ears) are fun and flow well with a sing-song feel about them; a must as anyone who has ever read a book over and over again (as will doubtlessly happen here) knows only too well. The illustrations take the form of colourful, eye-catching monsters in a way that is sure to appeal to the little, err, monsters in your life, the letters A through to Z given a life all of their own as they decide not to help Master Jet's endeavours to complete his homework, each having their own reasons for not showing up. This sounds like a super fun way to approach the ABCs. Terrific review!